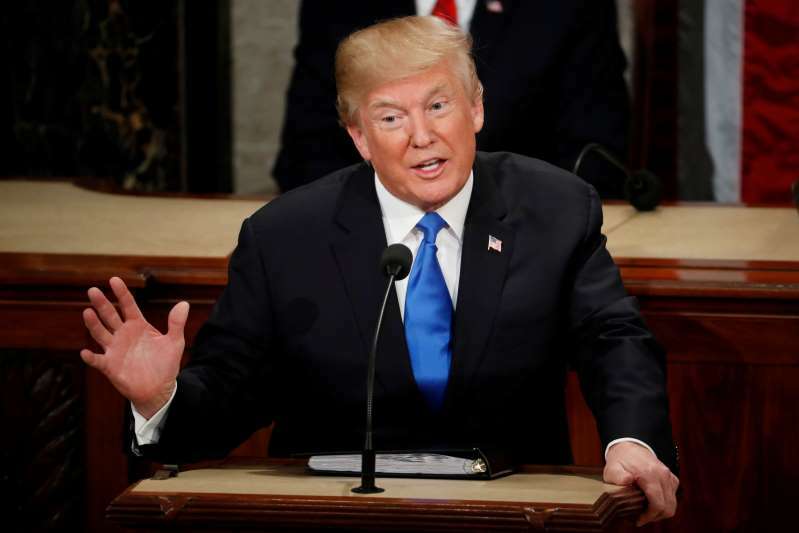 President Donald Trump used his State of the Union address to continue his push for a border wall and outline his agenda for the second half of his term, including a handful of specific proposals he asked Congress to consider. Trump called for bipartisanship in broad terms but also blasted the multiple investigations that have loomed over his presidency and pressed hard for immigration changes – including a border wall that Democrats flatly rejected. In a nation deeply divided over politics, Trump flicked at unity but offered few specific policies that would mend those divisions. The opening lines of the president’s speech noted the “unlimited potential” to advance an agenda that is not partisan. Trump managed to draw bipartisan applause during a handful of moments in his speech by mentioning the record number of women in Congress and paying tribute to an 81-year-old Holocaust survivor. But his tone quickly shifted. He noted conservative issues that divide the country, including abortion, immigration and the various investigations that have clouded his presidency. A large portion of Trump’s remarks highlighted the ongoing fight over immigration and his request for a wall along the southern U.S. border. Trump’s demands for border wall funding was central to the recent 35-day government shutdown, the longest in U.S. history. The speech was set in the middle of a three-week reprieve from the shutdown after Trump agreed to reopen the government without wall funding. Lawmakers are now negotiating to avoid another shutdown on Feb. 15. He also made a vow. “I’ll get it built,” Trump said of his border wall. Democrats have so far held steady in their opposition. Meanwhile, the president has continued to threaten to declare a national emergency to free up funding for the wall if the congressional panel does not deliver on his demand for the barrier. If Trump were to declare an emergency, the move could allow him to redirect billions of dollars in military construction projects. But it would also likely trigger a legal battle that could drag on in court for years. During his 82-minute speech, the president called for an end to the investigations that have clouded his first two years in office. Trump said the investigations, led by special counsel Robert Mueller and several congressional committees, were preventing the nation from coming together. The new Democratic majority in the House has called for transparency and has already started probing the president. The president’s former lawyer, Michael Cohen, is set to testify before Congress later this week about his role in the Russia investigation and a number of payments made to women who made allegations about Trump before the 2016 election. While Mueller is nearing the end of his two-year probe into Russian interference in the 2016 election, federal prosecutors in New York have opened another inquiry into the president and election. On Monday, Trump’s inaugural committee confirmed that it had received a subpoena, seeking documents linked to the committee’s fundraising activities, including donors and those who provided services to the organization. The subpoena could mean more legal trouble for the president. For months, both Republicans have Democrats have said they agree on one issue: infrastructure. Trump highlighted it as an agenda item that could draw bipartisan support in Congress but it might not be that easy. “Both parties should be able to unite for a great rebuilding of America’s crumbling infrastructure,” the president said. “I know that the Congress is eager to pass an infrastructure bill — and I am eager to work with you on legislation to deliver new and important infrastructure investment, including investments in the cutting edge industries of the future. Congress hasn’t agreed on how to fund such a proposal. Trump has called for infrastructure spending before with little to show for it. During last year’s State of the Union, he asked lawmakers to set aside $1.5 trillion to rebuild crumbling roads, bridges and airports. Early in his presidency there was hope that Democrats and Republicans could work together on an infrastructure spending package. But those prospects dimmed when the White House offered mixed signals about how to pay for the proposed investments. The White House has indicated that it wants the bulk of the spending to come from public-private partnerships. Trump and congressional Democrats have circled each other for the past two years over the issue of prescription drugs prices, a potentially fertile ground for a compromise that has never quite materialized. Trump, as expected, raised the issue again Tuesday, calling on lawmakers to take on the issue with legislation. Republicans and Democrats mostly agree on those broad talking points, but the breakdown occurs in how each party wants to address the problem. Trump told lawmakers he wants them to pass a bill “that finally takes on the problem of global freeloading.” That is a reference to the fact that patients in Europe and other countries that have stricter controls on the price of drugs often pay far less than Americans for the same medicine. The Trump administration launched a pilot program last year that would tie the cost of certain drugs to the prices paid overseas – an idea that has faced stiff resistance from the pharmaceutical industry. While prescription drug prices have traditionally been viewed as a potentially bipartisan issue, it’s not yet clear whether the president and House Democrats will have enough in common to achieve substantive reform. Many Democrats are wary of working with Republicans on health care following the GOP’s years-long push to repeal Obamacare. Trump criticized a recently approved New York law that guarantees a woman’s right to an abortion and he called on Congress to prohibit the “late-term abortion of children,” a term that has drawn criticism from abortion rights groups. It was the first time Trump had mentioned the issue in an address to Congress. The line drew hearty applause from Republican lawmakers in the chamber who view abortion as a salient issue in the 2020 elections, but it has no chance of advancing in Congress, where Democrats now control the House and have enough votes in the Senate to block controversial legislation. Trump – who once described himself as “very pro-choice” – attacked the law approved in New York. That legislation guaranteed a woman’s right to an abortion, consistent with the Supreme Court decision in Roe v. Wade, and allows abortions after 24 weeks of pregnancy it the fetus isn’t viable or the women’s health is threatened.